You can only eat so many blah turkey sandwiches or ho-hum dinner leftovers before caving to the call of fast food joints, right? You can only eat so many blah turkey sandwiches or ho-hum dinner leftovers before caving to the call of fast food joints, right? 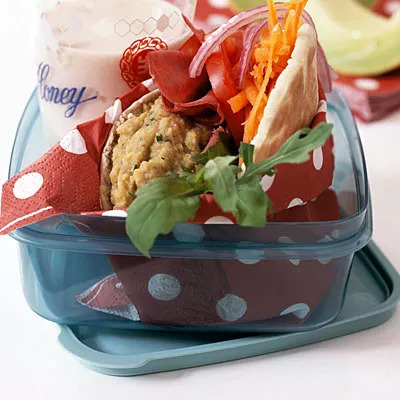 To break up the BYO monotony, here are five tricks to make your bagged lunch feel more special, so you wonât chuck it and head around the corner for some far less healthy take-away. We eat with our eyes as well as our stomachs, so playing part-time food stylist can really pay off. Packed meals that look and feel special can get you excited about eating healthfully again, like garden salads packed in mason jars, which are all over Pinterest (you put the dressing on the bottom so your greens don't get soggy), or meals that allow you to express your creativity, like stuffing tomatoes with filling, rather than chopping them up and adding them to your meal. Let your artistic side out, and fuel your foodie passionâand motivation to keep eating healthfullyâby sharing your culinary creations on social media. The allure of prepared food can be compelling (why do some things taste so much better when someone else makes them?!). But an entire pre-made meal may blow your healthy eating plan. To strike a balance, combine the two. Some of my clients pack their own healthy salad greens, complete with a serving of lean protein and whole grain, and then buy sides of pico and guac at a place like Chipotle to âdressâ the meal. Others bring generous servings of steamed veggies, which they combine with a purchased cup of soup or chili. Bought extras can feel like treats, but you still feel in control when you prepare at least a portion of you own meals, with the big picture of balance in mind. Between what you bring and buy, strive for lots of veggies (the size of 1 to 2 tennis balls), with a serving of lean protein (about the size of a smartphone), some type of healthy fat (extra virgin olive oil, guacamole, avocado, or nuts/seeds), and a small portion of healthy starch (such as brown or wild rice, organic corn, or quinoa). Kids love dips and fun shapes, and thereâs no reason you canât enjoy the same to spruce up your lunch break. I often recommend single-serve portions of guacamole, hummus, or tahini (sesame seed paste) with veggies for dipping to my adult clients, or advise them to swap a typical apple for a fun shaped fruit, like starfruit. We still love to feel carefree even as grown-ups, so finding ways to make lunch feel fun again can help you get out of a monotonous rut. One major way my clients have fallen in love with healthy eating again is by trying new foods, new spices, or even new ways of combining existing favorites. For example, if youâre burned out on salad greens topped with grilled chicken, add a new healthy starch to the mix, like black or red quinoa, purple sweet potato (amazing! ), or heirloom beans. Or spice up your meals with seasonings you havenât yet tried, like harissa, sumac, black garlic, grated ginger root, chili pepper, or lemongrass and kaffir lime leaves. (A quick Google search will give you ideas for ways to use these spices). Or try mixing things up in non-traditional ways, like using hummus as a salad dressing rather than a dip. When lunch feels like a culinary adventure, you can begin to get excited about healthy dishes. And bonus: Many herbs and spices have been linked to a metabolic boost and/or greater satiety, which can leave you feeling fuller longer compared to your regular fare. Iâm a huge advocate of a âdaily dark chocolate escape,â but some of my clients go beyond tossing a square or two of dark in their lunch bags. Several have packed a single truffle or treat from an artisan chocolate shop to savor after their meal. Just knowing they have this truly special goody waiting for them mid-day has allowed many of my clients to say âNo thanksâ to other less-appealing office treats, like donuts, pastries, or candy. If you decide to follow suit, take a few moments to truly savor your treat without distractions. The meditative aspect of enjoying your food mindfully has been shown to boost feelings of satiety, and curb the desire to indulge in other sweet and salty foods.